It’s a sad reality that many people with high hopes for their upper eyelid surgery end up disappointed. We know this because so many patients visit us to have a ‘secondary blepharoplasty’ (repeat eyelid surgery), because they are so disappointed with the first surgery performed elsewhere. To analyse this further, Dr Bryan Mendelson instigated a study that has now become the definitive series on secondary blepharoplasty, with results published in the prestigious journal Plastic and Reconstructive Surgery in March 2015. Why did these patients feel so unhappy with their first result? What was the underlying (surgical) cause of the problematic result? How long after surgery did their unhappiness begin? It found that it took only eight years (on average) for patient unhappiness to reach the point where they sought surgery to overcome the result of their first surgery. This is clearly a terrible outcome. The underlying reason was found to be the same in every instance: use of the old style ‘quick and easy’ (sometimes known as ‘nip and tuck’) techniques in the first surgery. That is, the surgeon had used an out-dated technique that relied upon tightening the eyelid skin to obtain a result. This technique of simply tightening the eyelid skin had led to the development of what is now known as the post-blepharoplasty look. This is the look that leads to so much patient unhappiness. Let’s explain this. While skin tightening can create an initial benefit, over time it leads to a paradoxical effect as the eyelid skin starts to stretch, creating the development of horizontal pleats of loose skin. In addition, the loss of the natural upper eyelid fold (as a result of skin tightening) makes the eyelid overly hollow with an exaggerated appearance. The combination of these two effects is the post-blepharoplasty look: gaunt, unattractive upper eyelids, with pleated skin on the lid fold, that look worse every year. It is far from the youthful, attractive look these patients were hoping for and their disappointment is understandable. The deterioration in result happens because the technique was never correct in the first place. It’s in sharp contrast to modern, advanced techniques of eyelid surgery, which are based on the correct understanding and application of eyelid anatomy, and which provide a result of eyelids similar in appearance to those of people with naturally attractive eyes. That’s because by changing the internal anatomy, a well-defined eyelid crease is created – naturally. And the skin is never stretched. 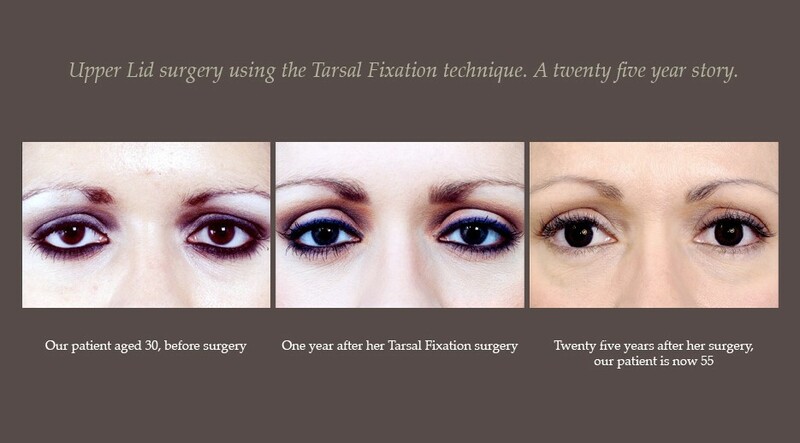 The technique we use at the Centre for Facial Plastic Surgery, Tarsal Fixation, is one of the most highly advanced. It works with the internal structures to create an attractive eyelid and eyelid crease. Because it is anatomically correct, the result does not (and cannot) deteriorate into a ‘post-blepharoplasty look’ but instead provides a permanent improvement. Ninety five per cent of patients will never need to do anything else about their eyes in the future. And the few who do only require a simple update procedure. We have patients still loving their eyelid surgery result more than twenty years later (they call it the ‘Bright Eyes’ procedure). The images here feature a patient over a twenty five year period post-surgery where a subtle yet attractive improvement has taken place.